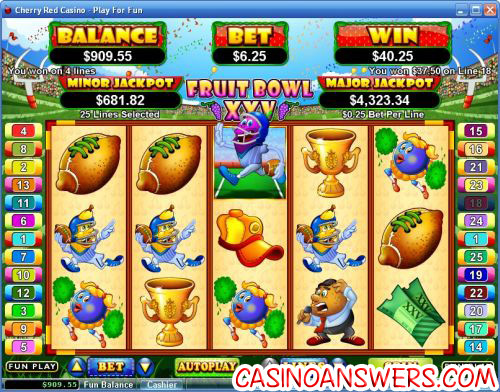 Fruit Bowl XXV Video Slot Guide & Review - Casino Answers! Fruit Bowl XXV is a 5-reel, 25-line video slot developed by Realtime Gaming, featuring a wild substitute symbol, scatter wins, multipliers, a free spins feature, a bonus game, two progressive jackpots and more. You can play the Fruit Bowl XXV Real-Series Video Slot at USA-friendly casinos Cherry Red Casino and Aladdin’s Gold Casino. Bets on the Fruit Bowl slot machine are $0.01, $0.02, $0.03, $0.04, $0.05, $0.06, $0.07, $0.08, $0.09, $0.10, $0.25, $0.50, $1, $2.50 and $5 per line. You can select from 1-25 lines. You can bet as little as a penny all the way up to $125 per spin. The Fruit Bowl slot game has a large betting range, suitable for all types of slots players. To manually stop the reels, you can hit the “Stop” button to activate the skill stop feature. To play the Fruit Bowl XXV, hit the “Spin” button. The highest paying symbol on the Fruit Bowl 25 online slot game is the Grape symbol. If you hit 5 Grape symbols on a selected payline, you will win the 7500 coin top fixed jackpot. The Grape symbol is a wild symbol and will substitute for all symbols except for the Fruit Bowl XXV scatter symbol. Other high paying symbols on the Fruit Bowl video slot are the Stadium (2500 coins) and the Banana player (1250 coins). Fruit Bowl XXV has two progressive jackpots – Minor and Major Jackpot. At the time of this writing, the Minor Jackpot is at $800 while the Major Jackpot is at $1,010. Both jackpots are rising steadily. The jackpots are won at random, so no winning combination is required to win them. Progressive Jackpot wins will be added to other game wins. Random Jackpot contribution is no more than 1.5% of total Return to Player. To attempt to win either of these progressive jackpots, sign up today at Cherry Red Casino! Fruit Bowl XXV’s scatter symbol is the Fruit Bowl XXV Logo symbol. During regular spins, 3, 4 or 5 scatter symbols anywhere on the reels will pay out 3X, 20X or 200X your total bet. During the free spins feature, 2 scatter symbols will pay out 1X your total bet as well. Fruit Bowl XXV has a Win-Win feature, which triggers when you win less than 10X your triggering bet or less during the free spins feature. If you don’t win anything during the free spins feature, you will win 250X your bet. If you win less than 2X, you will win 25X your bet. If your win is between 2-5X your bet, you will win 10X your bet. Finally, if your win is between 5-10X, you will win 5X your bet. The Win-Win special feature is great for those who get the short end of the stick during the free spins feature and ensures that if you are lucky enough to trigger the bonus game that you aren’t unlucky enough not to win anything during it. The Win-Win feature can only be triggered when you have all 25 paylines selected. 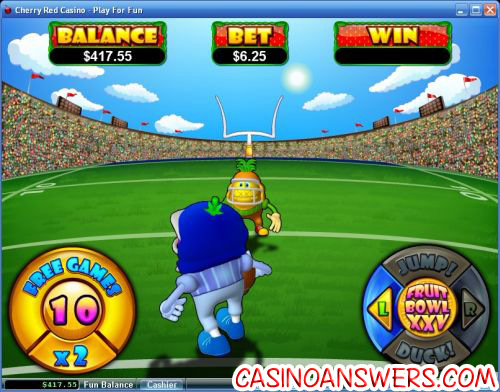 Hit the “Autoplay” button to open the autoplay settings on the Fruit Bowl XXV slot game. You will be able to set the number of spins, set it to stop when the jackpot is won, stop if a win exceeds or equals (any amount you input), stop on any win, stop if your balance increases/decreases by any amount you input and stop once the feature is triggered. You can stop the autoplay mode on Fruit Bowl XXV by using the “Stop Auto” button. To speed up the gameplay, simply hit the “Turbo Play” button in the autoplay settings. Wins on different paylines are added. Scatter wins are added to payline wins. Scatter wins are multiplied by total bet. Payline wins are multiplied by bet per line. Highest win only on each line. Maximum win per paid spin is 50,000X bet per line. Fruit Bowl XXV has a fun cartoonish theme that doesn’t require one to be a fan of American football or sports to enjoy. It also offers a plethora of special features from its two progressive jackpots, bonus game and free spins feature and the Win-Win feature. We can’t forget to mention that it has a great top jackpot of 7500X as well. To play the Fruit Bowl XXV video slot, sign up and deposit today at Cherry Red Casino! Are players from the United States able to play the Fruit Bowl slot game for real money? Yes, players from the United States of America are welcome to play Fruit Bowl XXV at Cherry Red Casino and Aladdin’s Gold Casino. For players outside the USA, you can also play the Fruit Bowl XXV video slot at King Solomons Casino or read our King Solomons Casino Review. Is there a free Flash game I can play of the Fruit Bowl XXV slot machine? Unfortunately, RTG casinos do not offer all of their games in their Instant Play casinos. However, you can get a taste of what the full casinos have to offer at Cherry Red Flash Casino and Aladdin’s Gold Flash Casino. Fruit Bowl 25 Slot Machine, Superbowl Slots, are there any football related slots?